In this week's Sound for Video Session we take a quick look at sending digital audio to camera using AES3 and also a couple of reporter's microphones. Sanken CSS-50 Short Shotgun Stereo Microphone - the episode was recorded with this microphone. This one is really nice but in reverberant spaces like this little room, it has a tough go with phase issues and comb filtering. Can't wait to test it outdoors. RODE Reporter Microphone - Getting ready for interviews on the show floor at National Association of Broadcasters again this year. Will be giving this a try. Last year we used the Sennheiser MD46 which worked pretty well but still suffered from some handling noise. Hoping this might solve that problem. Electrovoice RE50L Dynamic Reporter's Microphone - And this is the other reporter's mic we'll by trying at NAB. Both this and the RODE are dynamic microphones with omni-directional pickup patterns. While I get why they are dynamic (helps reduce pickup of ambient noise in the background), I was surprised to learn that they have omni-directional pickup patterns. I would have expected cardioid to help focus the mic and avoid noise. Instead, the design seems to rely on the dynamic capsule to manage noise and keeps the pickup pattern open so that the reporter doesn't have to move the mic as much. Looking forward to seeing how well they work on a noisy show floor. RODE iXLR Microphone Interface for iOS Recording - This is what I plan to use to record the sound for the interviews at NAB this year. Not sure the cable is long enough to use the phone as the camera, but we're going to give it a shot and see what happens. Blackmagic Ursa Mini Pro (Recorded the talking head portion with this camera) - My new main camera. One of my favorite features is that it takes AES3 digital audio from a mixer or microphone which can send digital audio. That means that the camera doesn't do the typically mediocre job of recording sound, now it can take top-notch sound from a pro-grade mixer or mic and just record the digital bits along with the video clips. Now we get the best of both worlds - amazing visuals from the camera and top-notch audio quality from my Sound Devices 633 all in a single file ready for edit. Sound Devices 633 Audio Mixer & Recorder - just tested the AES3 output for the first time this week and WOW! This solves another big problem. Now I get audio perfectly synced to video with my Ursa Mini Pro. Yay for more efficient workflows! Ethics statement: Some of the links above are affiliate links which means that if you click on them and buy, I get a small commission. You don't pay more by clicking these links than if you just went to the retailer’s web site on your own. 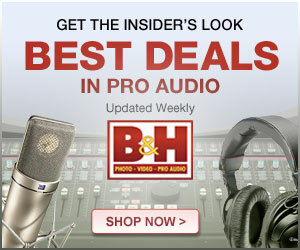 I use the proceeds to buy additional gear to review and help you improve your sound, lighting, and video. Thanks for your support!